Army Public School & College Mangla Cantt Punjab. Qualification: MPhil I MSc/ MA. ■ Min 5 yrs teaching experience Class College. ■ 5 yrs Administrative experience. Qualification: MSc / MA / BSc. ■ Min 3-5 yrs teaching experience. ■ Fresh candidates can also apply. Qualification: BSc / BCS / BA / BS Hons / FA. ■ Music qual will be preferred Retd BCS Army Offers will be preferred. ■ Recently Retired JCOs (Army) will be preferred. ■ Well reputed, financially sound with requisite experience will be preferred. • Single Accommodation for male teachers only. 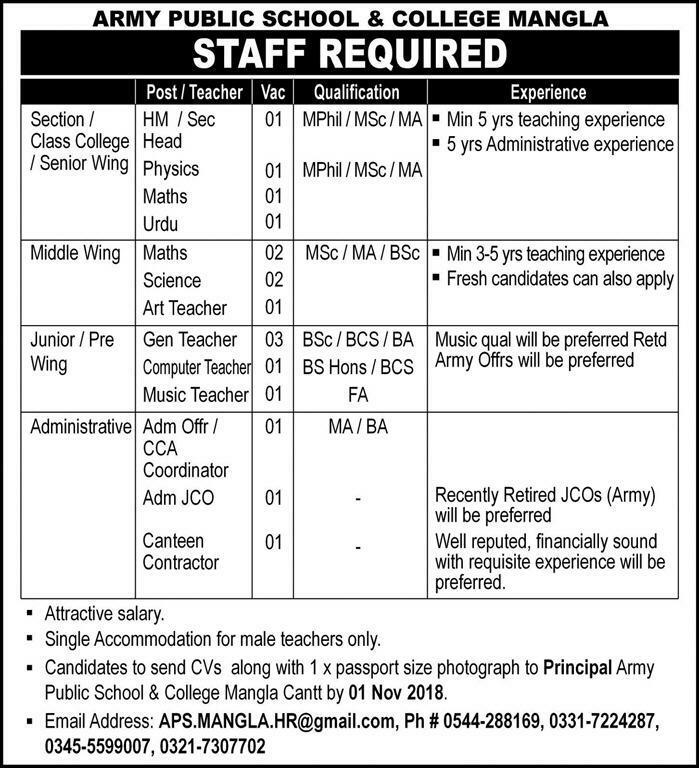 • Candidates to send CVs along with 1 x passport size photograph to Principal Army Public School & College Mangla Cantt by 01 Nov 2018.